Seasons Greetings! I hope you and yours are enjoying this beautiful holiday season. Before travel, celebrations, and much needed vacation time kicks in for everyone, I have some exciting end-of-year updates that I'd love to share with you all, along with a small ask. In October, we held a workshop with 16 incarcerated youth at Camp Afflerbaugh. This was our first time back in LA County probation camps in over two years and I'm pleased to say it was a huge success! These young men created an extremely moving, poignant, and timely film titled THE VANISHING BOXER, that I know will resonate with audiences. We also filmed our first ever behind-the-scenes documentary that we’re excited to share. Through this documentary, you all will be able to witness for the first time ever how our workshops operate, and how it positively impacts our youth. During my time at Camp Afflerbaugh, I was constantly reminded of the power of our program as I saw participants grow and accomplish things as filmmakers and actors that they never thought they could do. But beyond growing their skill set as artists, it hit me how our program impacts them on a much deeper level. The moment that best illustrates this is during graduation, when the youth found out the news of the Pittsburgh Synagogue massacre, where 11 people lost their lives to hate-fueled gun violence. Rather than celebrate their achievements with cake and punch, the youth decided to use their graduation time to write a condolence card for the victims’ families and the entire community of Pittsburgh. As I watched them pull out a huge sheet of butcher paper and decorate it with words of hope, love, and inspiration, I was almost moved to tears. Many of these young people have themselves experienced unspeakable violence, loss and trauma, but they looked beyond themselves to offer support and love to others. This moment reminded me that our program does so much more than teach incarcerated youth filmmaking skills — it opens their hearts. The artistic process allows traumatized youth to connect to their empathy and compassion for themselves and others. That is the healing power of the arts. That is the power of FYI Films. I have to admit that mailing the huge, homemade card to the Tree of Life synagogue was one of the proudest moments of my life and one that I will never forget. Right now we are in the post-production stages of THE VANISHING BOXER along with the behind the scenes documentary and could really use your help. We will screen these films in early 2019 (official screening date and announcement coming soon!) Anything you can give, big or small, will be used to complete the final stages of post-production, and help fund our next LA County workshop. Your donation will help to change young peoples lives for the better, teaching them filmmaking skills while also opening their hearts and allowing them to feel freedom and hope while they’re in an environment that can feel anything but. As a probation officer recently told me during our Camp Afflerbaugh workshop, "You know what I love about your program? When I see the youth playing around during the improv games and having fun making the film, it reminds me that they are children. And it's important that we remember that they are children.” Please support our efforts in engaging with incarcerated youth, a population often overlooked and forgotten, but sorely in need of our support and love, especially during this time of year. You can make your tax deductible donation HERE. Thank you for all you do. Be on the lookout for more exciting announcements in January, 2019! Until then, wishing you and yours a happy holiday season and a great new year. FYI FILMS Board Member Sonja Perryman and I recently had a very upbeat and inspiring meeting at Congresswoman Maxine Water's Office! 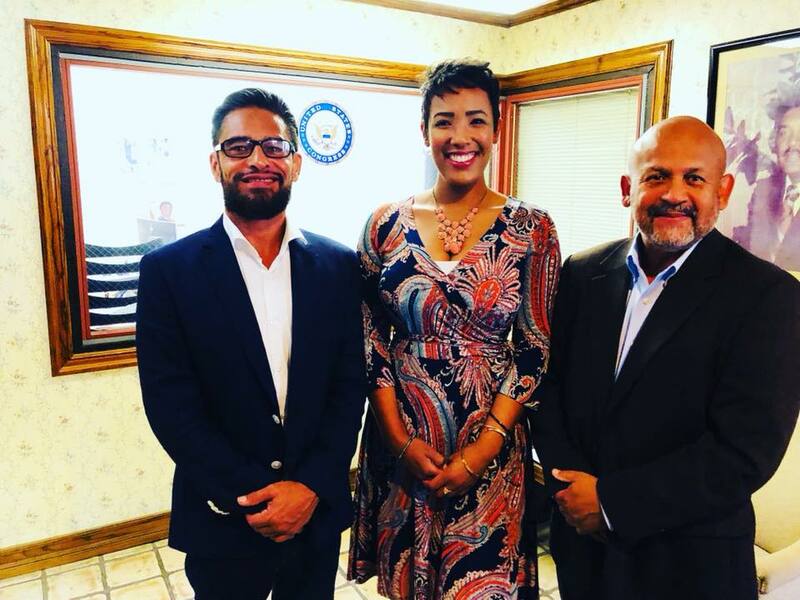 We had the pleasure of meeting with the Congresswoman's Special Projects Director Hamilton Cloud, who expressed intense interest in the work we do with incarcerated youth in LA County. There is something very exciting and out of this world in the works. As we left, Sonja and I were bloated with both excitement and optimism about the future of FYI FILMS. Believe me, there is so much more to come! Internationally renown architect Julie Eizenberg has joined the FYI FILMS BOARD! We are honored and thrilled to have Julie join our board as we ramp up, roll up our sleeves, and prepare to offer regular programming to incarcerated youth in LA County. Julie is especially excited that we will be conducting our first film workshop with incarcerated young women this fall. I met Julie while serving on the Virginia Avenue Park Advisory Board in Santa Monica. Our job was to help the city build a park that would meet the needs of the residents of the Pico Neighborhood. Julie listened attentively and carefully to every person who attended the public meetings. She taught me how to listen and engage people on a deep level. She helped me to understand the responsibility we all have to keep our communities safe, vital, and thriving. So happy she has joined the FYI FILMS family in our journey to support all youth affected by the Juvenile Justice System. "Hey Munoz. You know why they don't care about us? Because we are expendable - that's why." "Can you explain to us what you mean by that?" I asked him. "Look, I gotta work to help my family survive. So I ain't gonna graduate from high school cuz my family can't get by without the money I make from my part time job. I ain't gonna pass the SAT, and I ain't going to college. And if I don't go to college I won't get a good job, and if I don't get a good job, then I won't be paying Uncle Sam a lot of taxes, and I won't become a so-called good American consumer. Therefore I am expendable." We all sank in our chairs. I was stung by his hyper-loaded statement. I asked the other 15 students if they, too, felt expendable. They all nodded their heads in agreement. I cancelled the screenwriting lesson to address this sense of feeling expendable. We did improvs exploring marginalization and oppression. The improvs were laced with deflated dreams, pessimism about the future, and economic lethargy. "How do we change this feeling of being expendable?" I asked my students. We had a 90 minute discussion about creating a better environment for youth from disadvantaged communities. A healthy environment which would help them escape these intense feelings of expandability and marginalization. They made some interesting and radical suggestions such as: Creating public policy which restricts the hours that single mothers work. They found it unacceptable for a single mom to work more than 40 hours a week. They also wanted a limit on how many hours high school students work. Free day care for infants and toddlers at the schools where their older siblings went. When given the chance, our students come up with some radical solutions. As we prepare for our next FYI FILMS workshop in LA COUNTY, I force myself to do an audio recall of Antoinne's statement. We try to organize exercises and activities to reverse this type of thinking. Antoinne's statement, is what keeps me motivated. These youth are part of the Seventh Generation. The Generation that will change the world. I believe they will.